The Flight 4 Fantasy flight simulation centre at the Forum Mall Koramangala, Bangalore. 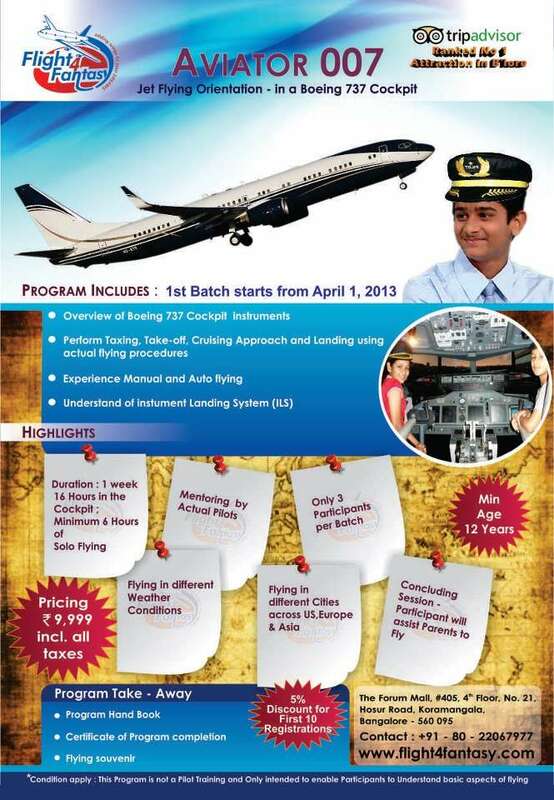 Learn to fly Boeing 737 NG, Cessna 172 or Fighter jets. Flying a plane is one of the most desired, but unfulfilled dream that most have. Live your dream in any of our high precision flight simulators. Flight 4 Fantasy is the First and only Flight Simulation Experience Zone, providing an experience of virtual flying to non-pilots. We look forward to welcoming you On Board to India’s most Realistic Entertainment Centre! Flight 4 Fantasy offers its guests realistic flight simulators, where they experience flying different types of aircrafts such as a Boeing 737, Cessna and Fighter Jets.